Israel’s UN Ambassador says Hamas was brought to justice despite the fact that the resolution against it did not pass. Israel’s UN Ambassador Danny Danon spoke on Thursday at the General Assembly after the US-drafted resolution condemning Hamas failed to achieve a majority of two-thirds and thus was not approved. “Today’s resolution presented an opportunity for redemption. 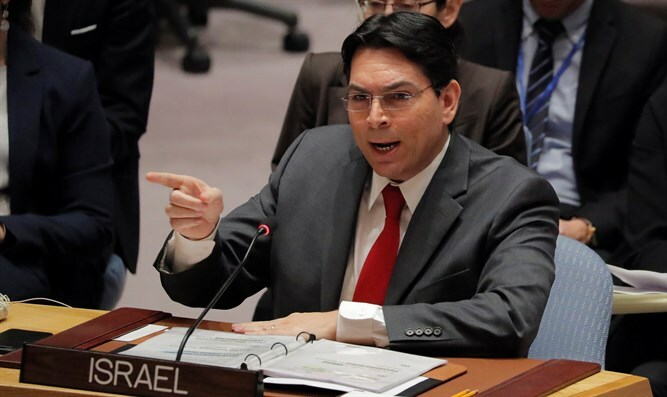 Proposed by the United States and supported by a global coalition, this resolution offered the United Nations another chance to finally condemn Hamas,” said Danon. “For those member states that rejected this resolution, you should be ashamed of yourselves. Wait when you will have to deal with terrorism in your own countries. Your silence in the face of evil reveals your true colors. It tells us what side you are really on: a side that does not care for the lives of innocent Israelis and innocent Palestinians who have fallen victim to the terrorists of Hamas. Those who endorse terrorism today will be forced to face its deadly consequences tomorrow,” he continued. “To Hamas, the world will not be silent until you stop your violent and illegal ways. Your time is up,” the Israeli Ambassador stressed. “Whether or not they choose to admit it, all of the member states in this room know full well that Hamas is a radical Islamic terror organization dedicated to the destruction of Israel,” said Danon, who pointed out how Hamas has launched over 13,000 rockets into Israeli communities over the last 13 years, how it launches rockets from neighborhoods in Gaza and how it has constructed nearly 40 terror tunnels that infiltrate Israeli border towns to kidnap and kill Israelis. “Hamas exploits the people of Gaza – its own Palestinian brothers and sisters – as human shields, an activity that is both illegal and deplorable. Hamas deprives its people of their basic human rights and steals billions of dollars of humanitarian aid – paid for by your citizens’ tax money – to fund its terror ambitions,” he said. Danon also noted that Hamas violates international law by continuing to hold the bodies of IDF soldiers Oron Shaul and Hadar Goldin as well as Israeli civilians Avera Mengistu and Hisham al-Sayed. “The UN has a legal and a moral obligation to ensure the return of our boys,” he stressed. “It will not be long until all of the nations of the world stop turning their backs on the thousands of Palestinian and Israeli victims of terror and finally make a clear and unequivocal statement condemning Hamas,” he concluded.